The Endoscopic Tutorial System with a Bleeding Complication also known as Patent# US 6863536 reminds me of that old poster about the movie, Alien that was slathered in all the New York subways and bus stops when it was released some 30 years ago. It read: “In space, no one can hear you scream.” Well, maybe they were right and then again maybe they were wrong, as when you get right down to it, this device is about as creepy as it gets. 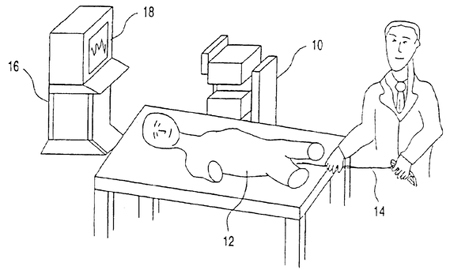 A system for simulating a medical procedure performed on a subject, one can only study it and wonder why. If you need a good laugh, you might want to consider reading up on the Endoscopic Tutorial System with a Bleeding Complication. It is comprised of four parts including: a simulated organ, a simulated instrument for performing the medical procedure, a locator to determine where the simulated instrument will go within the simulated organ and a visual display simulating the data received during the medical procedure. If all of this reminds you of that old song, It’s Only Make Believe, I can assure you it is not coincidence. Have a wonderful medical procedure and don’t forget to…not tell me anything about it!